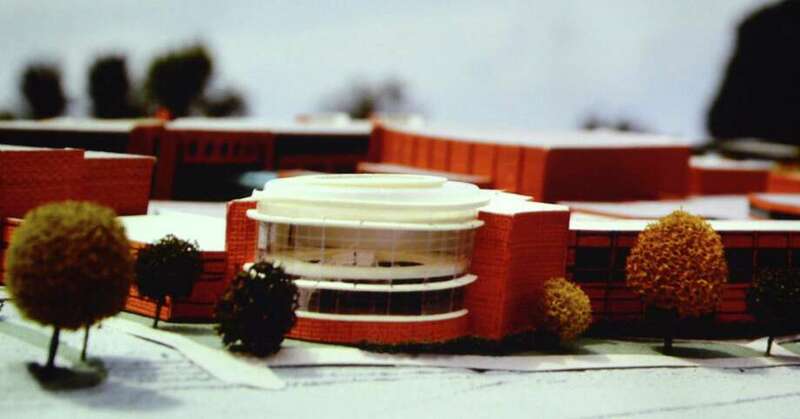 A rendering shows a proposal to build a $21 million wing at Staples High School. Despite the allure of a state-of-the-art technology center, the Board of Education won’t get behind a $21 million expansion project for Staples High School without more information. “I’m just afraid it’s about two steps further than where we are right now,” member Karen Kleine said Monday night, echoing the concern of others that neither enrollment projections nor program aspirations currently appear to warrant the proposal. Joseph Fuller, principal of Fuller and D’Angelo, P.C., which designed the high school’s 2005 addition, on Monday made a presentation to the board on a proposal to build a 36,000-square-foot, two-story addition at the southeast side of the existing structure. The addition would house additional classrooms, workrooms and a two-story technology center with a wealth of cutting-edge features. “Staples is running at 118 percent of its original anticipated design … It’s high tide and there’s a wave coming, so I think it’s best to be prepared,” he said, noting the existing school is designed for 1,800 students. “I was a little surprised when we got this full-blown plan,” said member Brett Aronow, who expected a $20,000 feasibility study to merely be an examination of space utilization. “It’s a huge dollar sign and the question is, as a Board of Education, is this where we want to spend our money?” she said. “A project of this magnitude will be very difficult to support with only four years of forward projected enrollment or demographics,” said member Paul Block. “I totally agree that we need to get back into the fundamentals and look at enrollment,” he said. Landon, who introduced several Staples department heads in attendance, said the space was required for necessary program work in world language, social studies, science and other disciplines. Steve Halstead, a former school board chairman, spoke in favor of the project. “You need a facility that enables the delivery of the program that you as the Board of Ed in the community want and demand,” he said. Sue Calger, the only other member of the public to speak on the Staples proposal, shared other thoughts. “This is beautiful, (but) I think there needs to be some more evaluation of the space, creative use of the space … It just seems so quick to push something like this through that costs that much money,” she said. “This is an educational issue,” Landon said, noting that board simply has to decide whether or not it wants to have the proposed facilities. Gordon said the administration and board would regroup to review enrollment projections and demographics, current space utilization and the vision for future programming at the high school.